This morning first year marine scientists ventured out to collect data that they used to compare the biodiversity of two areas that they selected. 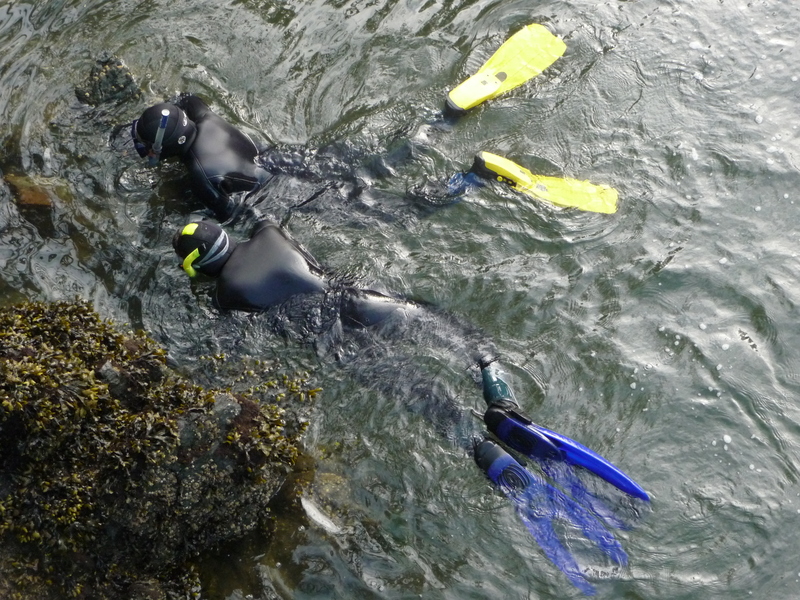 Ela (in the yellow boots above) compared the diversity of organisms in two areas of the rocky intertidal – one that is regularly exposed to freshwater from a drain pipe and one that is not near the drain pipe outlet (in the very upper left of the photo above). 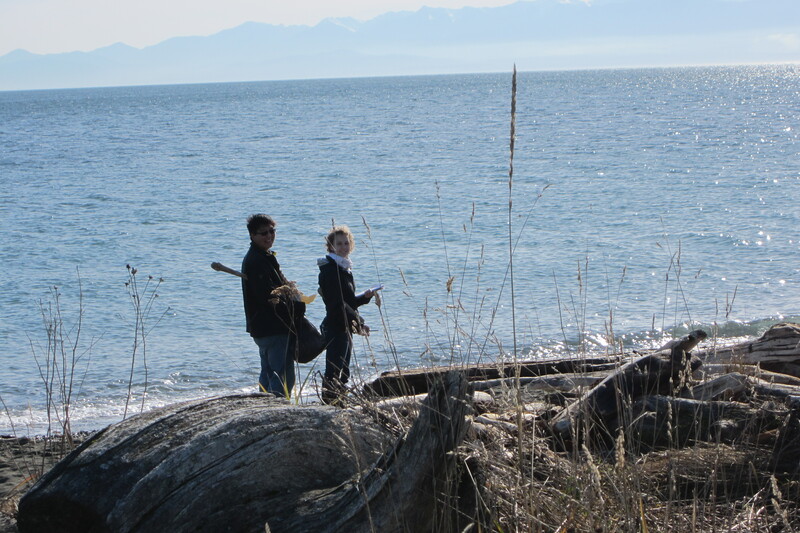 Angela and Jessica (both close to the water level in the photo above) each investigated the effect of height in the intertidal on diversity. 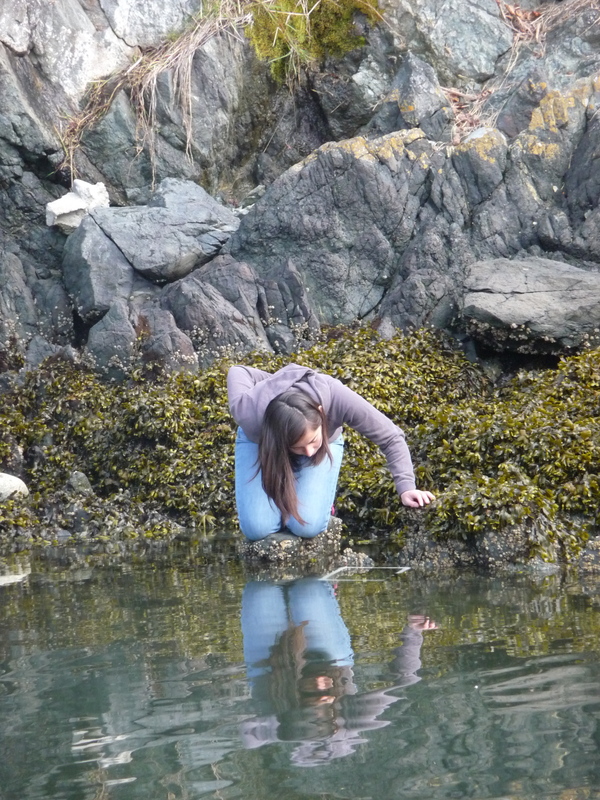 Angela (above) again identifying and counting organisms in the low intertidal. Miguel (blue fins) and Mariana (yellow fins) chose to focus only on sea star diversity. 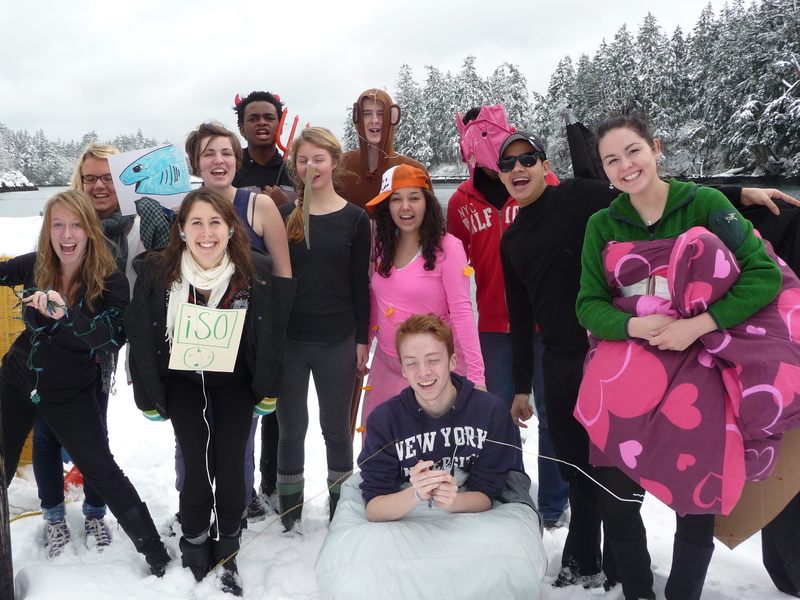 They got into their wetsuits at 7 am! 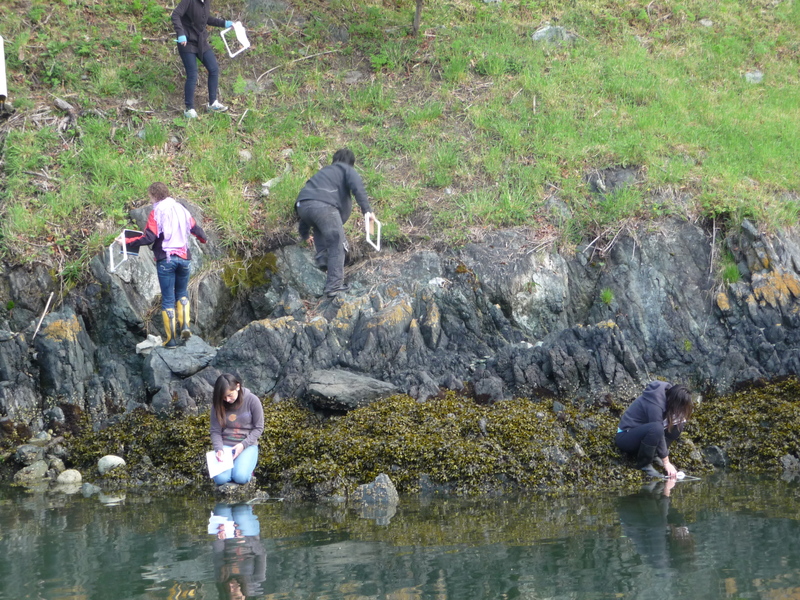 and jumped into the water to compare the diversity of sea stars near the Pearson College docks and a short distance away from the docks. 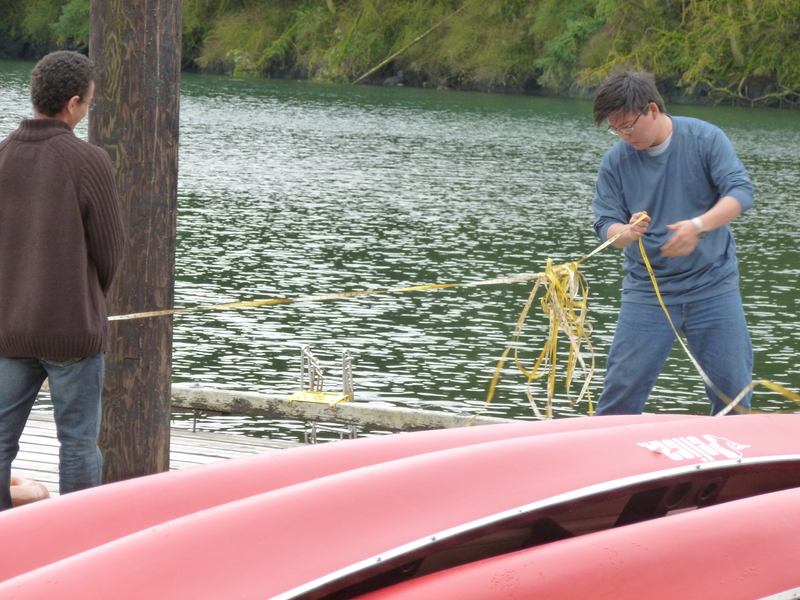 Jon elected to sample plankton at the mouth of Pedder Bay and near the Pearson College docks. While there is no photographic evidence of his work he learned that there is a great deal of diversity in the plankton sampled at both locations! 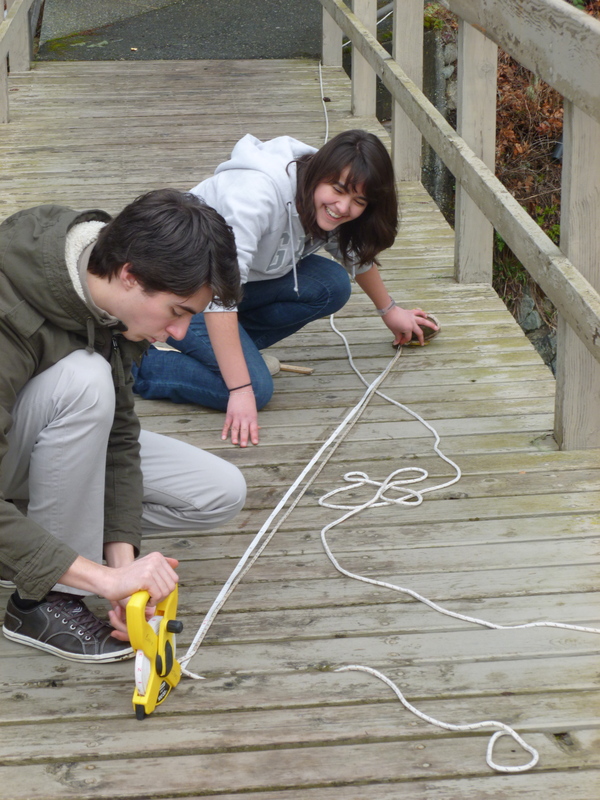 On 17 February, first year marine scientists were challenged to: “Design a method to measure the change in tidal height at the PC docks over 48 hours.” They were required to have at least 20 data points within the 48 hour period. 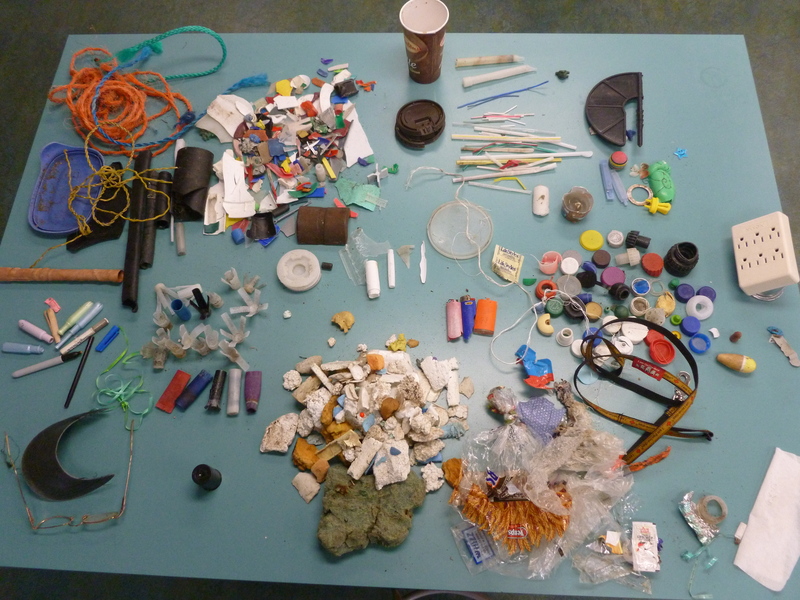 Students came up with various methods, some of which are described below. 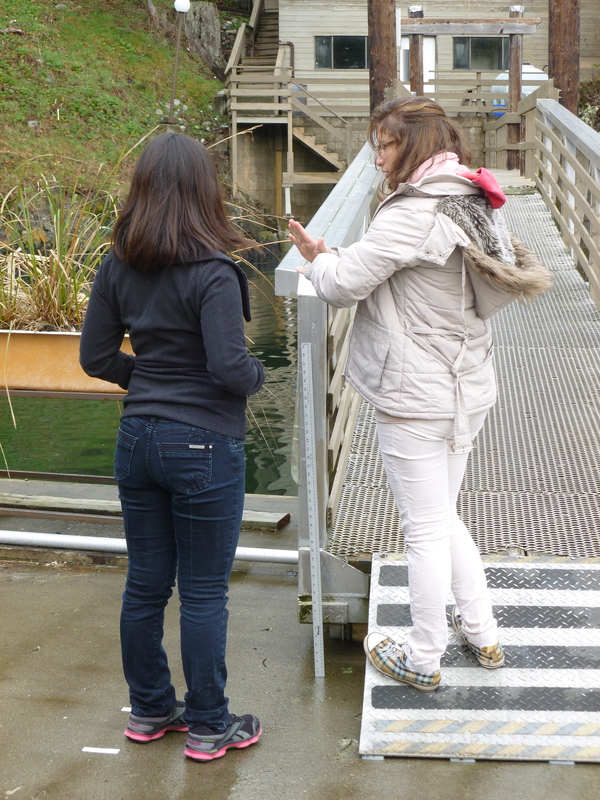 Thea & Amanda measured the change in the distance to the water level from the bridge going to the lower level of the floating building. 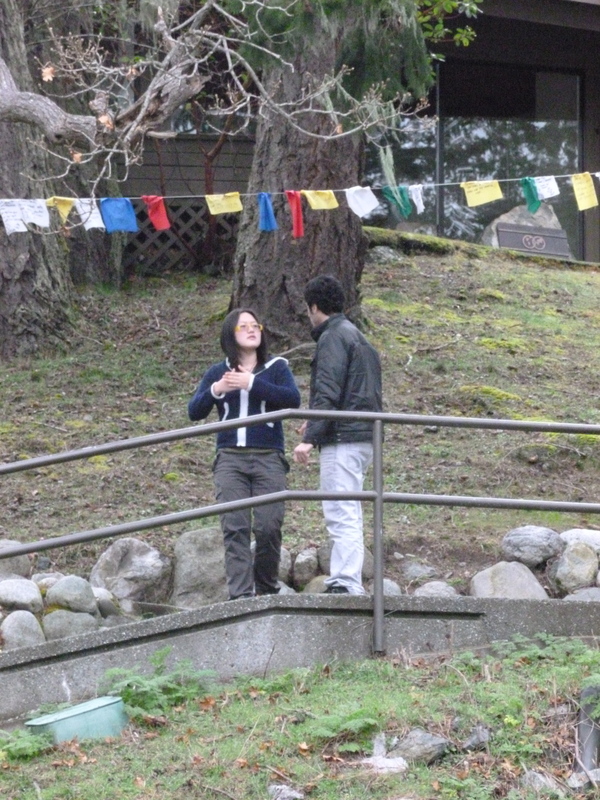 Ben & Mariana used a similar technique from the bridge going to the upper level of the floating building. 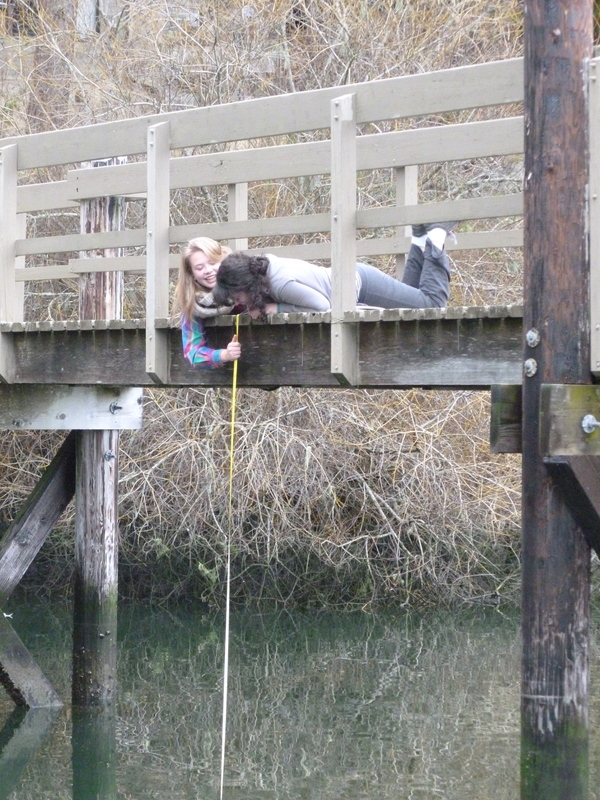 Angela & Felicia measured the change in the height of the ramp going to the docks. Mohamed & Chris did eventually manage to untangle the measuring tape above then nailed it to a piling and recorded the change in water level relative to the tape. 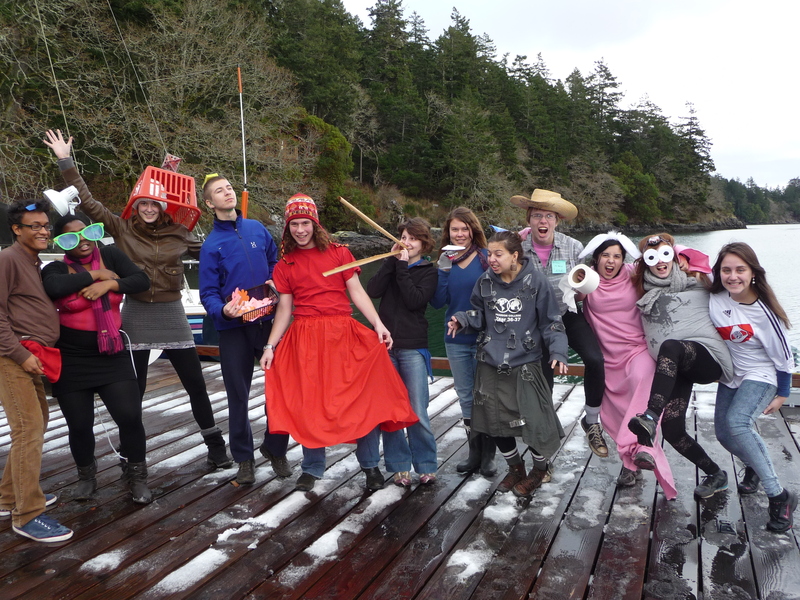 Many creative methods resulted in data that were then graphed and compared to the prediction of tide heights for Pedder Bay over 48 hours from 17 to 19 February 2012. 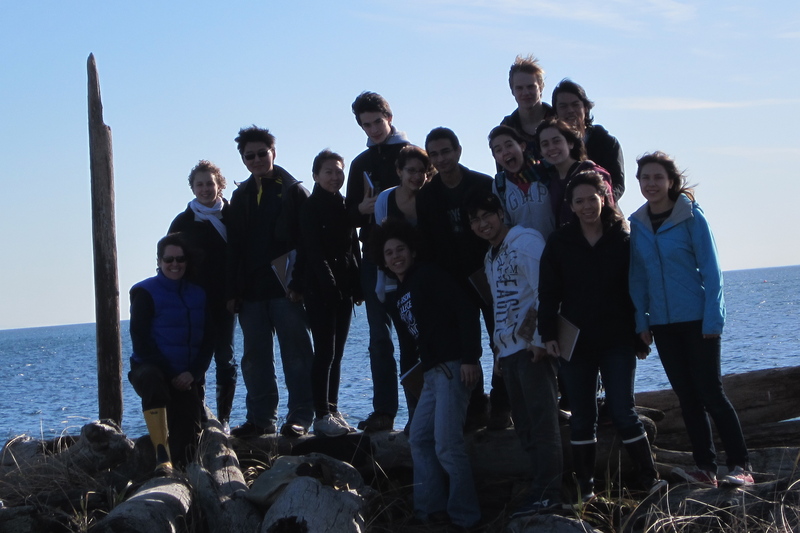 (from http://tbone.biol.sc.edu/tide/tideshow.cgi?site=Pedder+Bay%2C+British+Columbia).